Official figures released by Japan’s Ministry of Foreign Affairs have revealed that the majority of foreign nationals living in Japan are primarily from the country of Gaikoku. China recently surpassed The Rest Of Asia into the number two spot, with South Korea taking up the fourth and final ranking. Very little is known about the country of Gaikoku besides consisting mainly of young white men. Gaikoku is believed to have only two seasons but a group of pioneering scientists recently released a study arguing that a third Gaikoku season may exist. It is widely accepted that Gaikoku and its inhabitants have absolutely nothing in common with the nation of Japan. 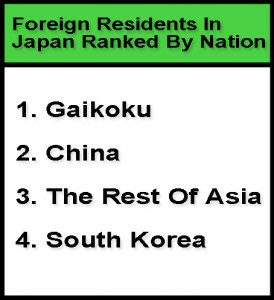 Gaikoku has remained at the top of the ‘Foreign Residents in Japan Ranked by Nation’ list since records began due mainly to its large population size of about 6.3 billion people. You obviously didn’t read the name of the person you were replying to. Yes, but not really funny enough. Nice! Except I would have labelled “Rest of Asia” as simply “Asia”, seeing as Japanese don’t consider themselves Asian and Asian Food generally means food from Thailand, Vietnam, Malaysia, etc. “Rest of Asia” meaning besides China and South Korea. Not besides Japan. Actually, China and the Korean peninsula aren’t quite アジア. アジア starts around Taiwan and southwards. So namster got it right. But Mongolia…? 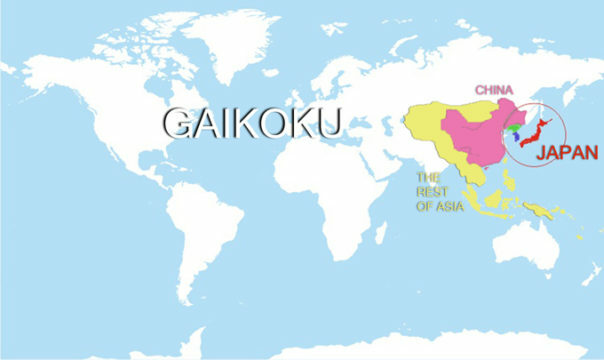 I wonder how many seasons they have in Gaikoku? People from Gaikoku can’t eat natto (they’re all allergic), although astonishingly some of them have somehow learned how to use chopsticks so they can eat noodle! Can people from Gaikoku use chopsticks? I’m hurt that the author didn’t distinguish between gaijin and cho-gaijin, we are not the same race! An ad for a Japanese ski manufacturer once touted that its products were clearly superior to all those imports from Gaikoku as theirs were the only ones designed for Japanese snow! Fake! Japanese always assume all countries have all 4 seasons. Have you actually spoken to a Japanese person recently? I am offended and I find this Gaikoku. A guy I know actually puts on the Facebook page for his business in Japan, “Foreigner Owned”, which I think is hilarious. I didn’t know “we” foreigners were a group lol. The funny thing is, it’s actually true. Whenever my family sends me something from Germany and I have a notice in the post box because I wasn’t at home, it always says I received a shipment from Gaikoku.